...The intellectual challenge may satisfy me on the surface, but when I compose a piece that moves the spirit, whether intellectually charged or not, I am truly satisfied. Andrián Pertout was born in Santiago, Chile, 17 October, 1963, and lived in Gorizia, Northern Italy, for several years before finally settling in Melbourne, Australia, in 1972. In 2007, he completed a Doctor of Philosophy (PhD) degree at the University of Melbourne on Tweddle Trust, APA and MRS scholarships, studying composition under the guidance of Brenton Broadstock. 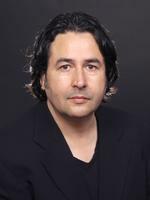 He is currently the President of the Melbourne Composers' League (MCL), Australian Delegate of the Asian Composers' League (ACL), and was Honorary Fellow at the Melbourne Conservatorium of Music, University of Melbourne (2007-2015). As well as being a freelance composer, he additionally works as composition lecturer, teacher, supervisor and examiner at the University of Melbourne and other institutions at Bachelor, Masters and PhD levels. Composition awards include the Boston Metro Opera 'Mainstage Award' (USA), Jean Bogan Prize, 'John Cage Centennial' Wolf Museum of Music and Art Composition Prize (USA), Friends & Enemies of New Music Composition Prize (USA), International Music Prize for Excellence in Composition (Greece), UnTwelve Composition Prize (USA), Dorian Le Gallienne Composition Prize, Betty Amsden Award, Louisville Orchestra Prize (USA), APRA Award for Orchestral Composition, Oare String Orchestra Judges' and Audience Prize (UK), Michelle Morrow Memorial Award, and the Zavod Jazz/Classical Fusion Award. Pertout's music has received performances at festivals such as the ISCM World Music Days 2005, 2007 and 2010 (Croatia, Hong Kong and Australia), 33e Festival d'Automne á Paris (Paris, France), and the 22nd, 26th, 27th, 30th, 31st, 32nd, 33rd and 34th ACL Conference & Festival 2002, 2007, 2009, 2012, 2013, 2014, 2015 and 2016 (Korea, New Zealand, Israel, Singapore, Japan, Philippines and Vietnam). His music has also been performed in over forty countries by orchestras, ensembles and performers that include the Melbourne and Tasmanian Symphony Orchestras, Orchestra Victoria, The Louisville Orchestra (USA), Jerusalem Symphony Orchestra (Israel), Orquestra Petrobrás Sinfônica (Brazil), Tatarstan National Symphony Orchestra (Russia), Uzbekistan National Symphony Orchestra (Uzbekistan), Orquesta Sinfónica Nacional de México (Mexico), Vietnam National Opera and Theatre Choir and National Symphony Orchestra (Vietnam), Sun Symphony Orchestra (Vietnam), Orquestra Cia Bachiana Brasileira (Brazil), Orquesta Sinfónica de Puerto Rico (Puerto Rico), The Foundation Orchestra (USA), Veridian Symphony Orchestra (USA), Orquesta Sinfónica Nacional de Chile and Concepción (Chile), Orquesta de Cámara de Chile and Valdivia (Chile), Logos Foundation Robot Orchestra (Belgium), University of Hong Kong Gamelan Orchestra (China), La Chapelle Musicale de Tournai (Belgium), Oare String Orchestra (UK), Noah Getz (USA), Phyllis Chen (USA), Michael Kieran Harvey (Australia), Ónix Ensamble (Mexico), Ensamble Contemporáneo (Chile), Ensemble MD7 (Slovenia), Quinteto CEAMC (Argentina), Sonemus Ensemble (Bosnia-Herzegovina), Ensemble TIMF (Korea), Omni Ensemble (USA), and the Ensemble für Neue Musik Zürich (Switzerland). He has received numerous commissions, including recent orchestral works commissioned by the Orquesta Marga Marga (Chile), Orquesta Sinfónica Nacional de Chile - a homenaje to Enrique Soro (Chile), 14th 'Europe-Asia' International Festival of New Music for performance by the Tatarstan National Symphony Orchestra (Russia), and a Concertino-Doppio for alto saxophone, harp and string orchestra commissioned by the American Harp Society, Inc. New York, NY (USA), as well as the 'Compulsory Chilean Work to be Performed by all Competitors' of the 2011 Concurso Internacional de Ejecución Musical 'Dr. Luis Sigall' (Chile), a new solo work for Paris-based pianist María Paz Santibañez (France), and a work for robot orchestra incorporating thirty-seven automats for the Logos Foundation Robot Orchestra (Belgium). Other works include commissions by the Tasmanian Symphony Orchestra, Victoria Chorale, Art of Sound Orchestra, Orquesta de Cámara de Valdivia (Chile), saxophonist Noah Getz (USA), toy pianist Phyllis Chen (USA), and Ensemble MD7 (Slovenia). Julian Burnside AO QC has additionally commissioned several works for performance by the University of Hong Kong Gamelan Orchestra, Australian Discovery Orchestra, Australian pianist Michael Kieran Harvey, Australian clarinettist Richard Rourke, American 'low flutes' specialist Peter Sheridan and Melbourne ensemble Plexus. Film Music commissions include works that have been written to accompany over thirty documentary and short films, television programs, as well as commercials, computer games and stage productions. As a writer, Pertout has published over 400 articles in music publications such as Mixdown, Spanish Herald, Australian Musician, and the Sunday Herald Sun. His articles range from reviews of new musical technology, compact disc and book releases to interviews with prominent national and international artists, including Herbie Hancock, Steve Reich, Joe Satriani, Rick Wakeman and José Feliciano. Saral aavart gati : for pianoforte (2018) Composed in celebration of the 50th Anniversary of Move Records as part of the ‘Sounds of Matter’ Project, Faculty of Physics, University of Vienna, Austria. Saral aavart gati : for violin, violoncello and pianoforte (2018) Composed for the ‘Sounds of Matter’ Project International Composition Competition, Faculty of Physics, University of Vienna, Austria and Vienna University of Music and Performing Arts. Atoms of Silence : for symphony orchestra (2018) Commissioned by Julian Burnside.